Every year I look forward to seeing this sign. A sign that is in Greek that means great food and fun times. At the Annapolis Greek Festival at the Sts. Constantine & Helen Church on Riva Road an outrageous amount of food is served this weekend. Of course, the Baklava is to die for. Other favorites are Kourambiedes and Finikia. 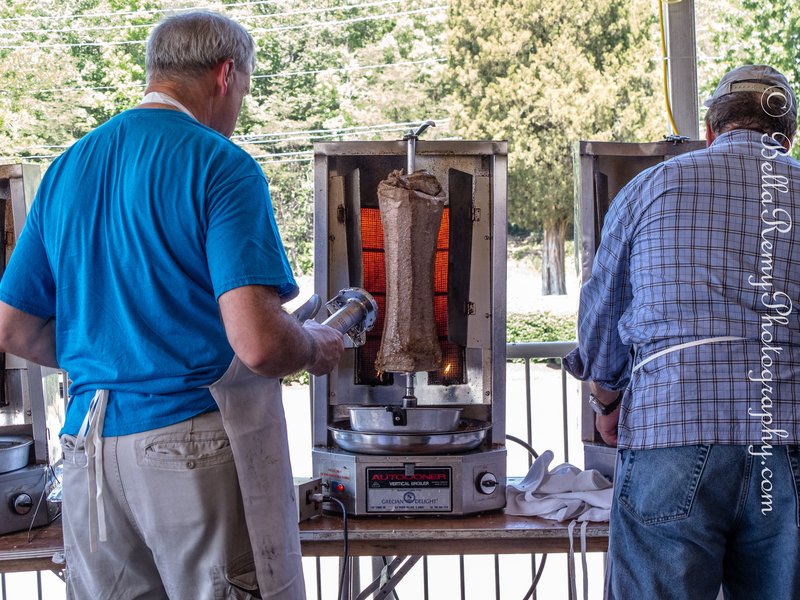 The festival also offers a full range of main course dishes with gyros leading the pack. Quickly followed by other hard to pronounce Greek food like Dolmades, Pastitsio, Moussaka, Spanakopita, Tyropita, Arni, Plaki and Greek Oreganato. As if the festival, the food and the people weren’t enough. The crowning jewel of the festival is the elaborate and stunning church chapel. Built between 1995 and 2005, it took over five years to decorate the alcoves and ceilings of the church. Painted in Greece on canvas and brought to Annapolis with the artisans and craftsmen, these paintings are truly works of art. If you’re in the area and have never gone to the Greek festival in Annapolis, Maryland. What are you waiting for ? This is truly a fantastic event. May we all be Greek for a Day. 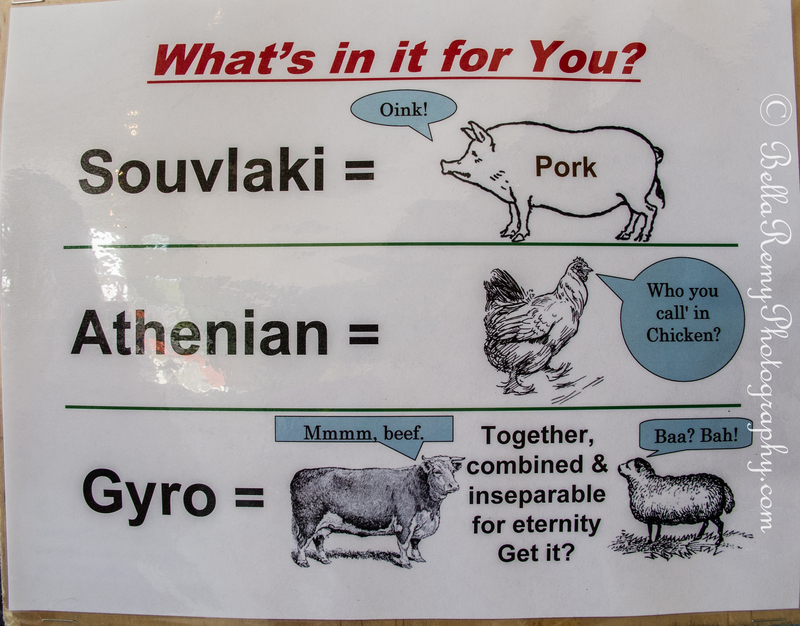 I am jealous – love Greek food – would have thought I went to heaven at this festival:) Happy Weekend! Oh this is right up your alley Renee. I can see it now, you and I with ouzo shots, dancing Greek and saying OPA! You know me – living it LARGE!!! It’s a fantastic food fest. Hope you can find one close to where you are. Oh my, that food looks so good! I’ll take a dozen of each! It really is incredible good. I did bring home a dozen, but are now all gone. What a fun day! We have Greek days in Vancouver every year! They block off part of Broadway, a main thoroughfare for one day! There is music, dancing and tons of food! The perfect time to have a camera! Great photos, Emily!!! Now that sounds like a huge festival. How fabulous ! Can’t wait until you go and show us your photos. Oy… Is Zorba the greek there? Beam me over, Emily. I would love to have you here too Perpetua. Rebecca just mentioned that Vancouver has a huge Greek fest. You should go with her. Great, I gained 10 pounds back watching the slide show! Seriously, the chapel as captured in your photos is stunning! LOL ! Aren’t I just the sweet one. 🙂 The chapel is such an amazing work of art and I’m sure the church paid a TON of money to have it built. The Greeks run Annapolis sort of unseen. Their money comes from shipping. Lovely post – makes me wish I lived nearer! Alas, I fear the ocean between us will make a visit impossible. Seeing it here is definitely the next best thing though. Why did I think you are stateside? Where are you? I would love to have you here to enjoy the festival as well. Surely there are some Greeks where you are. Hi. I live in England! We did have dinner at The Real Greek in London on Thurs – will that count? That will totally count ! Enjoy ! Great series of shots, Emily. The interior of the Greek church are very, very colorful, and your shots are really true-to-life. Thank you so much Tom. As you are so fortunate to enjoy the opulent churches in Europe/Italy, you can truly appreciate the beauty of this church. It’s easy to have great pics with such a bright subject. This is with my little point & shoot. One more thing. Now who’s making whom hungry? I love everything about the Greek culture along with the food and drink! There is a temple that has a fest every year here also that we attend. I’m sure they are everywhere, just look! Thanks for the mouth watering reminder! Oh wonderful ! You can enjoy the excitement I do with this festival. Love the Greeks! Have you heard of Tarpon Springs in Florida? That is a true Greek community that was built on sponge diving. I’ve enjoyed it the past couple of days and I want more!